Lelaina: I just don't understand why things just can't go back to normal at the end of the half hour like on the Brady Bunch or something. Troy Dyer: Well, 'cause Mr. Brady died of AIDS. Things don't turn out like that. 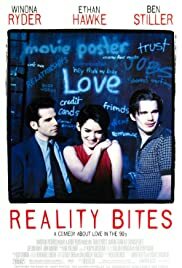 I rented this movie knowing it wasn't really a comedy but a drama about the life of people in their early twenties in the 90's. What pushed me to rent it was the fact that many people qualified this film as horrible, but many other people loved this film and were talking about it like it was the most realistic thing ever. Let's face it. I'm not going to pretend to know what it's like to be a teenager/young adult in the 90's since I was 9 years old when this movie came out. However, I think I have a good enough judgement to tell if this movie was realistic or not based on my personal experiences. 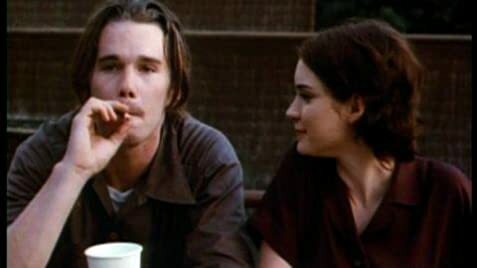 This movie isn't specially about the 90's, it's about "becoming an adult" and all it implies. It's about a cast of characters who hesitate between forever living what they were told is a pointless life [always having fun and bumming around] and becoming like the adults that they have criticized so much in their childhood. This, by itself, is very realistic, because it's a problem that many young people face even today. The main character Lalaina represents this fact completely. She's shooting a video of her friends as they struggle to find themselves in this world that was built by baby-boomers that they can't relate to. Also, she's a very clean-cut and hard working person, yet she hangs out with her friends who are more of the "rebellious" type. This movie tries to represent the "alternative" crowd. Each character in this movie has an "alternative" as well as a "conformist" side, which is very strange. By example, you have a female character who wears vintage clothes and lives in a typical artsy room but works at the gap. This is another side of what was mentioning earlier. As young adults, they're straying away from the whole "alternative-ness" of their teenage years. This is something I've seen among people I know as well, and that I personally dislike. I guess it's something very typical of our era as well as the 90's. What I found unrealistic in this movie was that the characters seem a bit cliché sometimes. Sure, I've seen people like that. But the personalities in the movie are too simplified. By example, there's the guy who always is slacking around doing nothing because he feels that having a full-time job until you retire is like wasting your life. Okay, but what else? What type of person is this guy, really? Also.. Each of the characters seem to act the way they do because they come from broken homes, which isn't very realistic in my opinion... The video that the main character has made is supposed to make their viewers know her friends and herself, but we don't really get to know them by watching the entire movie. Overall, I thought it was an enjoyable movie. I liked the atmosphere of it. It also wasn't always predictable. I gave this movie a 7 because I liked it even though I disliked some of it's aspects.